ARBITRATION NOTICE: YOU AGREE THAT DISPUTES BETWEEN YOU AND CATCH & FEATER WILL BE RESOLVED BY BINDING, INDIVIDUAL ARBITRATION AND YOU WAIVE YOUR RIGHT TO PARTICIPATE IN A CLASS ACTION LAWSUIT OR CLASS-WIDE ARBITRATION. AS MORE FULLY SET FORTH BELOW. The information on this Site is intended for general informational purposes and should not be relied on as the sole basis for making decisions. Catch & Feather does not guarantee that the information contained on this Site is current, accurate or complete. Neither we nor any third party provides any warranty or guarantee as to the accuracy, timeliness, performance, completeness or suitability of the information and materials found or offered on the Site for any particular purpose. You acknowledge that such information and materials may contain inaccuracies or errors, and we expressly exclude liability for any such inaccuracies or errors to the fullest extent permitted by law. You rely on the information and materials on this Site at your own risk. It shall be your own responsibility to ensure that any products, services, information or materials available through the Site meet your specific requirements. The information on this Site does not constitute a binding offer of Catch & Feather to sell products featured on this Site. We reserve the right to change the contents of this Site or any portion thereof (including, without limitation, the availability of any products offered on the Site) at any time, for any reason, and without notice, and shall not have any obligation to update any information contained on this Site. No employment, partnership, agency of joint venture relationship exists between Catch & Feather and you as a result of your use of this Site or these Terms. Although Catch & Feather tries its best to display our products and their colors as accurately as possible, colors of the products which are actually displayed depend upon computer hardware of the user, and Catch & Feather cannot guarantee that such hardware will accurately display the colors of the products. There is also the possibility that products displayed on the Site may be out-of-stock or discontinued, and the prices which are displayed are also subject to change. Catch & Feather is not responsible for typographical or other errors regarding price or any other matter. Prices quoted on this Site are denominated in U.S. dollars and are valid and effective only in the United States. You are prohibited from purchasing any item from this Site with the intent to resell it, unless it is a special order and prior reselling authorization has been given in writing by Catch & Feather. Products displayed on the Site are available while supplies last. The inclusion of any product on the Site at a particular time does not imply or warrant that such product will be available at any time. Catch & Feather reserves the right to discontinue or change specifications and/or prices of products offered on the Site at any time without prior notice. Descriptions of, images of, or references to, products on the Site do not constitute a warranty by Catch & Feather, and may not exactly reflect the product you receive. Catch & Feather is committed to providing information that is accurate. However, due to human error or otherwise, the Site may contain pricing, product descriptions, quantities, images, product discontinuation and/or other content that may be incorrect, incomplete, unreliable, not current, and/or not error-free. Although we make every effort to ensure these mistakes do not happen, Catch & Feather cannot honor incorrect prices, misprints, or typographical errors. Errors in advertised prices are not binding on Catch & Feather, and may be adjusted by Catch & Feather at any time. Catch & Feather reserves the right, in its sole discretion, to accept or decline your order, in part or in total, even after your credit card has been charged and you receive confirmation of your order. If your order is cancelled after your credit card has been charged, a credit will be issued to your credit card account. Catch & Feather shall not be liable to anyone for withdrawing any product from the Site or for refusing to accept any order. Catch & Feather, its licensors or its content providers are the owners of and have exclusive rights to all of the content on this Site, including, but not limited to, all designs, text, images, logos, graphics, media clips and downloads, layouts, appearances, interfaces, computer code and software (“Content”). 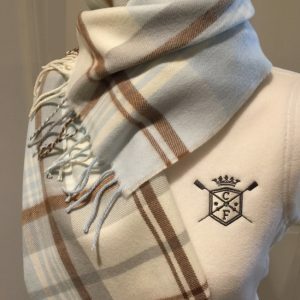 All trademarks, service marks, logos and other Content displayed or featured on the Site, including, but not limited to “Catch & Feather”, “Catch & Feather since 2014”, “Row Well. 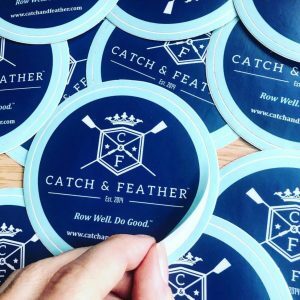 Do Good”, and the Catch & Feather “crest” logo and Catch & Feather “winky crest” logo are the property of Catch & Feather, with the exception of trademarks displayed or featured on the Site which are acknowledged on the Site as not the property of or licensed to Catch & Feather. In addition, this Site and its contents are protected by copyright laws. Nothing on this Site shall be construed as granting by implication, estoppel or otherwise, any right or license to use any Content on this Site (including, without limitation, any trademark, service mark or logo featured on this Site) without the prior written consent of Catch & Feather. You acknowledge that you shall not construe anything on this Site as granting any license or right to use any Content (including, without limitation, any trademark, service mark or logo), either explicitly, implicitly, by estoppel or otherwise. Catch & Feather reserves all rights not expressly granted or relinquished herein in regards to the Site and its Content. You represent that you own or otherwise have the legal right to the material you submit to the Site. You agree to grant Catch & Feather a non-exclusive, irrevocable and perpetual right to use, modify, reproduce, publish, distribute, display and create derivative works from any material which you submit to the Site. Such right shall include the right to use your name and any personal information you submit. Catch & Feather shall not be responsible and assumes no liability for Content uploaded on the Site by users. You accept that you use the Site at your own risk, and that Catch & Feather will not be responsible or liable for the conduct of any user, including, without limitation, with respect to Content submitted by users. You acknowledge and agree that Catch & Feather is not responsible for, and does not endorse, Content posted via the Site by users, and that Catch & Feather shall have no obligation to prescreen, monitor, edit, or remove any user-submitted Content. Catch & Feather is committed to protecting its intellectual property rights as well as the intellectual property rights of others. To report any infringement of your intellectual property rights on this Site, please submit a DMCA Notice in accordance with our Copyright Infringement Policy set forth below. Catch & Feather reserves the right, at its discretion, to refuse or terminate a person’s registration, or deny access to this Site. Catch & Feather grants you a license to use this Site and such license is revocable by us, and in our sole discretion, at any time and for any reason. You are prohibited from using, modifying, distributing, broadcasting, transferring, transmitting, uploading, licensing, selling, reverse engineering or creating derivative works from any Content on this Site (including, without limitation, any trademark, service mark or logo featured on this Site). You are also prohibited from using the Site for any marketing or solicitation purposes or to otherwise compete with Catch & Feather in any manner whatsoever. You may not use the Site for or in furtherance of any illegal or unauthorized purpose. You agree to comply with all laws, rules, and regulations (including, without limitation, federal, state, local and provincial) applicable to your use of the Site. By using this Site you agree to be held responsible for any material you submit through this Site and to indemnify Catch & Feather for all claims that result from your submissions. You agree that you shall be held personally liable for all orders placed or charges incurred, prior to your account being terminated. You acknowledge that you may not submit, upload, publish or distribute through this Site any material that could give rise to claims of libel, defamation, fraud, obscenity, or claims of any civil or criminal liability. Further, you agree that anything you submit to Catch & Feather shall not violate any right of any third party, including privacy, trademark, copyright, property, confidentiality, or any other intellectual or other personal right. You agree that you will not submit any material that contains a computer virus, spam or any software or computer code designed to damage, interfere with or mine data from the Site. You agree that you will not submit violent, pornographic, discriminatory, unlawful, infringing, or hateful photographs or other content via the Site. You agree that you will not defame, stalk, bully, abuse, harass, threaten, impersonate or intimidate any persons or entities via the Site. You agree that you will not publicly post private or confidential information via the Site, including, without limitation, your or any other person’s credit card information, social security or alternate national identity numbers, non-public phone numbers, or non-public email addresses. You are responsible for any and all activity that occurs through your account, and you agree that you will not sell, transfer, license or assign your account. You agree that you will not create an account for anyone other than yourself, and that you will not create an account or otherwise use the Site in a manner that does or is intended to mislead, confuse, or deceive others. You may not create a link to this Site from another web site or document without our prior written consent. You must not interfere or disrupt the Site or servers or networks connected to the Site, including by transmission of any worms, viruses, spyware, malware or any other harmful program or code of a destructive or disruptive nature. You must not inject content or code or otherwise alter or interfere with the way the Site and/or any page therein is rendered or displayed in a user’s browser or device. THIS SITE IS PRESENTED ON AN “AS IS” BASIS AND YOU ACKNOWLEDGE THAT YOUR USE OF THIS SITE IS AT YOUR OWN RISK. CATCH & FEATHER RESERVES THE RIGHT TO LIMIT OR RESTRICT YOUR ACCESS TO THE SITE IN ANY WAY AND AT ANY TIME. CATCH & FEATHER EXPRESSLY DISCLAIMS ANY AND ALL WARRANTIES OF ANY TYPE, WHETHER EXPRESS OR IMPLIED, INCLUDING BUT NOT LIMITED TO: 1) IMPLIED WARRANTIES OF FITNESS FOR A PARTICULAR PURPOSE AND MERCHANTABILITY; 2) WARRANTIES IMPLIED FROM A COURSE OF DEALING OR PERFORMANCE; 3) WARRANTIES THAT THE SITE OR THE SITE’S SERVER WILL BE FREE FROM VIRUSES; 4) THAT INFORMATION ON THE SITE WILL BE TIMELY, COMPLETE OR ACCURATE; 5) THAT THE SITE SHALL BE SECURE AND ERROR FREE; OR 6) THAT YOU USE OF THE SITE IS LAWFUL IN ANY PARTICULAR JURISDICTION. BY USING THIS SITE YOU AGREE AND ACKNOWLEDGE THAT YOU ASSUME FULL RESPONSIBILITY FOR ALL CONSEQUENCES RESULTING FROM YOUR USE OF THIS SITE. YOU AGREE, ACKNOWLEDGE AND ACCEPT: 1) THAT YOU DID NOT HAVE TO PAY TO USE THIS SITE; 2) THAT YOUR ACTIVITIES ON THE SITE ARE LAWFUL IN EVERY JURISDICTION WHERE YOU ACCESS OR USE THE SITE; AND 3) THAT, TO THE FULLEST EXTENT PERMITTED BY LAW, CATCH & FEATHER, ITS AFFILIATES, SUPPLIERS OR THIRD PARTY CONTENT PROVIDERS WILL NOT BE LIABLE FOR ANY DIRECT OR INDIRECT DAMAGES, INCLUDING CONSEQUENTIAL, SPECIAL, INCIDENTAL, PUNITIVE, EXEMPLARY OR ANY DAMAGES OF ANY KIND ARISING FROM: A) LOSS OF DATA OR DAMAGE TO YOUR COMPUTER THAT RESULTS FROM ANY MATERIALS YOU DOWNLOAD FROM THIS SITE, YOU DOWNLOAD AT YOUR OWN RISK; B) ANY ACTIONS TAKEN BY US OR WHICH WE FAIL TO TAKE REGARDING COMMUNICATIONS YOU SEND TO US; C) YOUR INABILITY TO USE THIS SITE; D) ANY PRODUCTS, SERVICES OR OTHER INFORMATION OR MATERIALS FEATURED ON THIS SITE, OR THE REMOVAL THEREOF; E) OR ANYTHING ARISING OUT OF YOUR USE OF THIS SITE OR ANY WEBSITE YOU ACCESS THROUGH THIS SITE. CATCH & FEATHER WILL NOT PROVIDE, AND YOU SHOULD NOT CONSTRUE ANY COMMUNICATION, INFORMATION OR ADVICE OBTAINED THROUGH THIS SITE, WHETHER ORAL OR WRITTEN, AS CREATING ANY WARRANTY OF ANY KIND. THE DISCLAIMERS IN THESE TERMS ARE VALID ONLY WHERE THEY ARE NOT PROHIBITED BY LAW. IN NO EVENT SHALL CATCH & FEATHER’S LIABILITY BE GREATER THAN THE PRICE YOU PAID FOR THE PRODUCT OR SERVICE THAT IS THE BASIS FOR THE CLAIM. YOU AGREE THAT IN THE EVENT YOU INCUR ANY DAMAGES, LOSSES OR INJURIES THAT ARISE OUR OF CATCH & FEATHER’S ACTS OR OMISSIONS, THE DAMAGES, IF ANY, CAUSED TO YOU ARE NOT IRREPARABLE OR SUFFICIENT TO ENTITLE YOU TO AN INJUNCTION PREVENT ANY EXPLOITATION OF ANY WEB SITE, SERVICE, PROPERTY, PRODUCT OR OTHER CONTENT OWNER OR CONTROLLED BY CATCH & FEATHER, AND YOU WILL HAVE NO RIGHTS TO ENJOIN OR RESTRAIN THE DEVELOPMENT, PRODUCTION, DISTRIBUTION, ADVERTISING, EXHIBITION OR EXPLOITATION OF ANY WEB SITE, PROPERTY, PRODUCT, SERVICE, OR OTHER CONTENT OWNED OR CONTROLLED BY CATCH & FEATHER. The Site may include links to other web sites. These links are provided for your convenience to provide further information. They do not signify that we endorse these web site(s). Catch & Feather makes no warranties of any kind regarding web sites which are not operated by Catch & Feather to which you may be directed or hyperlinked from this Site. These hyperlinks are included by Catch & Feather for your convenience, and Catch & Feather makes no representations or warranties with regard to the material on these sites or the suitability, safety or accuracy of any material on such web sites. 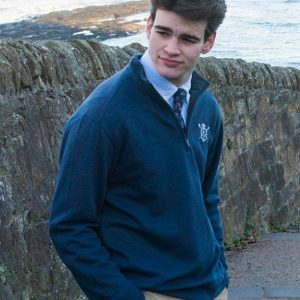 Catch & Feather has no responsibility for products or services offered or provided by any third party. Although it is Catch & Feather’s intention for the Site to be available as much as possible, there will be occasions when the Site may be interrupted, including, without limitation, for scheduled maintenance or upgrades, for emergency repairs, or due to failure of telecommunications links and/or equipment. Catch & Feather will not be liable to you for any modification, suspension, or discontinuation of the Site, or the loss of any Content. You also acknowledge that the Internet may be subject to breaches of security and that the submission of Content or other information may not be secure. With respect to products offered on the Site, Catch & Feather expressly excludes and disclaims warranties, conditions, or terms whether implied by statute, common law, or otherwise to the fullest extent permitted by law. Any recommendation or suggestion relating to any product made by us is given in good faith, but it is for you to satisfy yourself as to the suitability of the product for your purposes. You also represent that all information you provide via the Site upon registration and at all other times will be true, accurate, current and complete and you agree to update your information as necessary to maintain its truth and accuracy. You agree to hold harmless, defend and indemnify Catch & Feather and any of our affiliates, officers, directors, employees, agents, licensors, contractors, subcontractors, service providers and suppliers against any and all damages, losses, costs, expenses, liabilities, including any all reasonable court costs and attorneys’ fees which result from any violation of these Terms, a technical problem you experience with the Site, or any issues resulting from your use of the Site. Catch & Feather reserves the exclusive right, at Catch & Feather’s own expense, to assume control of the defense of any matter for which you would be held responsible for indemnifying Catch & Feather for any losses incurred. You agree to cooperate with Catch & Feather in regards to the defense of any such matter. For any dispute you have with Catch & Feather, you agree with first contact us and attempt to resolve the dispute with us informally. If the prohibition against class actions and other claims brought on behalf of third parties contained above is found to be unenforceable, then all of the preceding language in this Arbitration section will be null and void. This arbitration agreement will survive the termination of your relationship with Catch & Feather. You agree that any claim you may have arising from or related to your relationship with Catch & Feather must be filed within one (1) year after such claim arise; otherwise, your claim shall be permanently barred. This Site is intended to be accessed and used where such access and use is permitted by law. This Site and these Terms are governed by the laws of the State of Connecticut. Catch & Feather does not guaranty that accessing or using this Site complies with the laws of the jurisdiction in which you are located. It is your responsibility to educate yourself as to the laws of your jurisdiction and act accordingly. By using this Site you are irrevocably consenting to the non-exclusive jurisdiction of the state and federal courts located in the State of Connecticut for purposes of adjudicating any action relating to these Terms and waive any objection to venue or jurisdiction in such actions. You understand that these Terms and any other policies posted on this Site shall constitute the entire agreement and understanding between you and us regarding the subject matter thereof (the “Agreement”). You understand that the Agreement shall supersede all other, prior or contemporaneous communications between you and us, whether those communications are oral or written. A printed copy of these Terms shall be admissible, under the same conditions and to the same extent as other business documents and records, in a judicial or administrative proceeding that relates to the use of the Site. If any provision of the Agreement is found to be unenforceable, unlawful or invalid for any reason, that provision shall be severable, and all other provisions shall remain in full force and effect. You are responsible for periodically checking this Site for any changes to these Terms. Catch & Feather may amend, alter or change these Terms, in our sole discretion, at any time and for any reason, by posting on this Site a revised version of these Terms. If you continue to use this Site after changes to these Terms are posted then you consent to being governed by such changes. Catch & Feather’s failure to enforce or exercise any provision or right of these Terms shall not be deemed a waiver of such provision or right. 5.A statement by you, made under penalty of perjury, that the above information in your notice is accurate and that you are the copyright owner or are authorized to act on behalf of the copyright owner. We suggest that you consult your legal advisor before filing a notice with Catch & Feather’s copyright agent, because there may be penalties for false claims.